The Blacksmiths is an epic fantasy octalogy of which The Soul Smith is the first in the series. Each installment is aptly named for each of the demigods that rule over the turbulent world of Thornwall. Using their divine forging hammers to alter the realm to their liking, they are collectively known as the Blacksmiths! 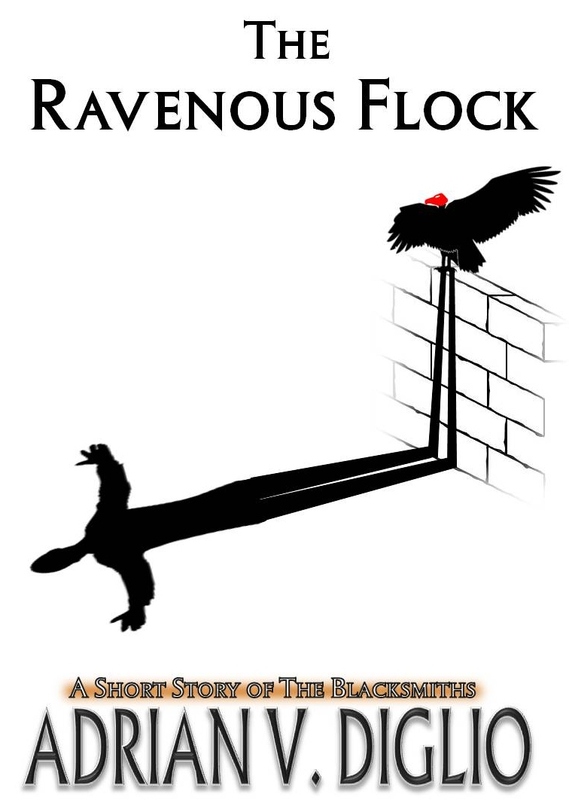 THE RAVENOUS FLOCK: Originally published by Myths Inscribed ezine. Part 1 published in March 2013. Part 2 published in August 2013. Now available on Kindle! Awake. Trapped beneath the rubble of an avalanche and circled by bickering vultures flying overhead, Grindor the Ravenous is pulled from the debris and rescued from almost certain death. Though, during recovery, he finds himself in a whole new world of trouble as his savior, Ocamyr, is holding him captive. Ocamyr, a large man-sized hawk, has grown obsessive over how Grindor obtained his master’s ring. Worse still, the vultures are following him. Grindor realizes he needs Ocamyr’s help more than ever and for better or for worse, decides to tell Ocamyr the tale of the ring. Discover Grindor’s past, learn how he got his name and the story behind his ring in this no-holds-barred fantasy adventure! THE SOUL SMITH: Clan Wyndlyn, a tribe of antler-endowed warriors known as elkin, have united their forces with a neighboring clan. Though Erador Wyndlyn, a promising warrior that takes pride in his heritage, grows suspicious of the other clan’s intentions. It isn’t long before Erador finds himself thrust into a position of leadership over the clan after the murder of his father. His first order of business: vengeance. And he’ll do anything to get it. However, his crusade for revenge unknowingly leads him amidst the dealings of a demi-god. Come see what the hype is about and read Chapter 1 for free! The Chromium Smith – Coming next!